Build Them Up, Break Them Down! Constructs have been a staple of fantasy stories for decades and it's no surprise that they are just as prevalent in the world of Golarion. These creatures include the likes of simple clockwork familiars all the way to the colossi, towering constructs the size of entire keeps. 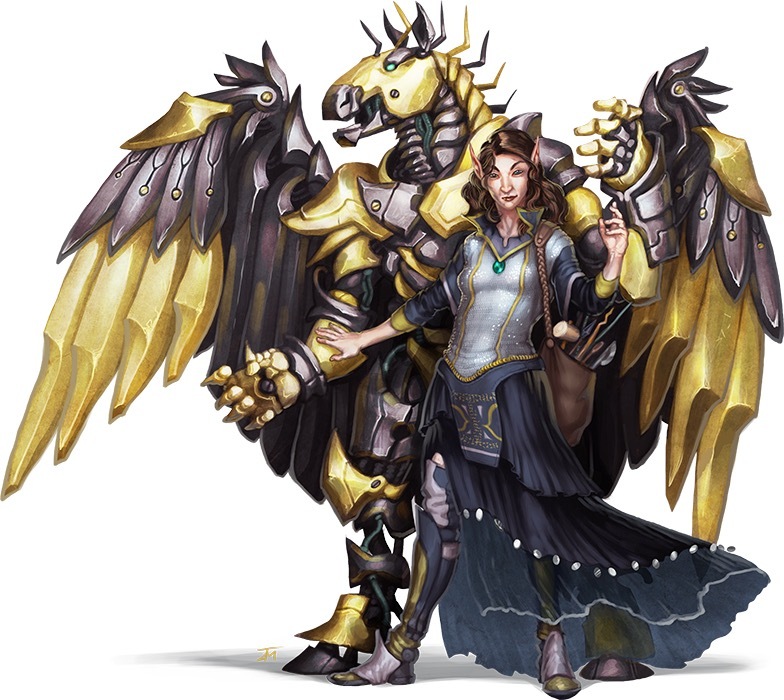 Pathfinder Campaign Setting: Construct Handbook takes a look at these created creatures and provides new options for both players and GMs that wish to build up the presence of constructs in their adventures. While the majority of this book is intended for GM use, the first portion of the book does provide a significant amount of material for players. In particular, the book contains a full break down of the rules for crafting a construct, providing detailed information on each portion of the process. It also contains additional construct modifications to expand on those found in Ultimate Magic. A number of new magical items also help with the handling of constructs, including new golem manuals to ease with the crafting of all new types of golems or machinebane oil that can slow down hostile constucts. Players wishing to receive their own construct will find a few of the book's archetypes, such as the clocksmith wizard or the construct caller unchained summoner archetypes, to be very helpful. On the other hand, if you find yourself constantly fighting constructs, you might want to take a look at some of the other archetypes within. A Forgefather's seeker paladin is all about putting a stop to harmful constructs with abilities like smite construct and the scrapper fighter can take parts from broken constructs to improve his armor. The main portion of this book is our enormous bestiary. This bestiary has several new constructs from different categories for GMs to use in their game. Some of these include more common constructs like clockworks or golems, but also a new construct category: the mysterious automatons! Automatons are constructs created during the height of the Jistka Imperium and feature powerful abilities like the stalker automaton's adaptive camouflage or the sharpshooter automaton's energy beam. GMs wishing to continue using some of their favorite constructs can change things up with several new templates. A haunted construct is a construct infused with an evil soul that takes over the construct's body, while a runeplated construct is one infused with the sin magic of Thassilon. So that's why they said I would love the steam-powered template. Is there a steam powered giraffe? That is hysterical.. until you think about it then it is just freaking evil. No stealth for you and "hoof to the head." 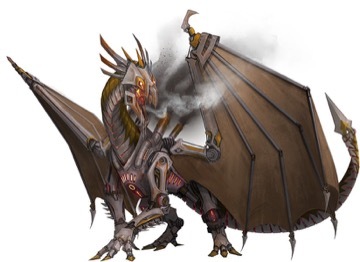 Ratfolk saboteur NPC: "If anyzing goes wrong, make a sound like a steam-powered giraffe." Guards: "Hey did you hear that? Sounds like a construct giraffe is venting steam over there." Oh goody, haunted constructs, just the perfect thing to use with stuff from Horror Adventures! Though some of the people I know would only have some of them be evil, and I know why. Most of the archetypes are just okay, but 2 stand out: Construct Saboteur and Voice of Brigh. The Construct Collector archetype is really confusing. It seems to contradict itself. I REALLY want to play a Voice of Brigh in my Iron Gods campaign, but I'm presently the only front line fighter. Wandering NPC: "Nah, that's just that steam-powered bard, Pietyr Gabyreal, warming up for a show." Looking forward to using it!! Neat, glad we're still getting cool stuff for Classic PF. I hope that I can play a mechanical-eagle mounted Paladin. That would be amazing. Seems like you're making a chicken out of a feather...but as they say, hard verk pays off!